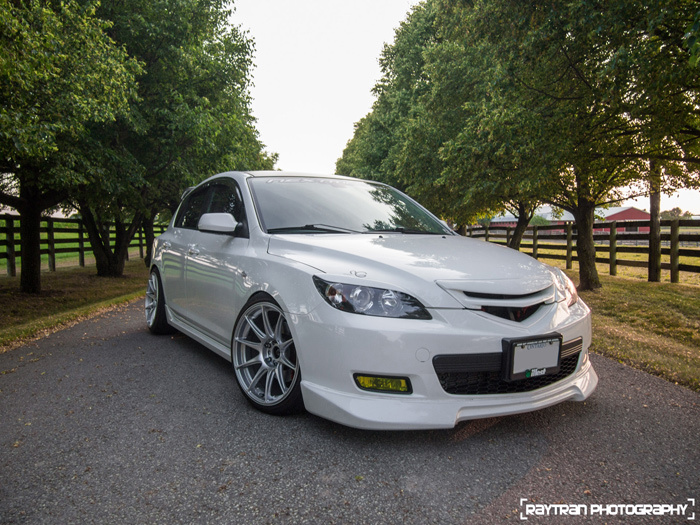 Like a lot of other platforms the Mazda 3 community can be broken down into three groups when it comes to wheel fitment. Group one consists of those who are quite vehemently opposed to stretched tires and shudder at the thought of camber outside of factory spec, while group two consists of those who are not afraid of making significant body modifications to push fitment to the limit of the chassis. Somewhere between those two groups lies group three, those who find that spot between not enough and too much. 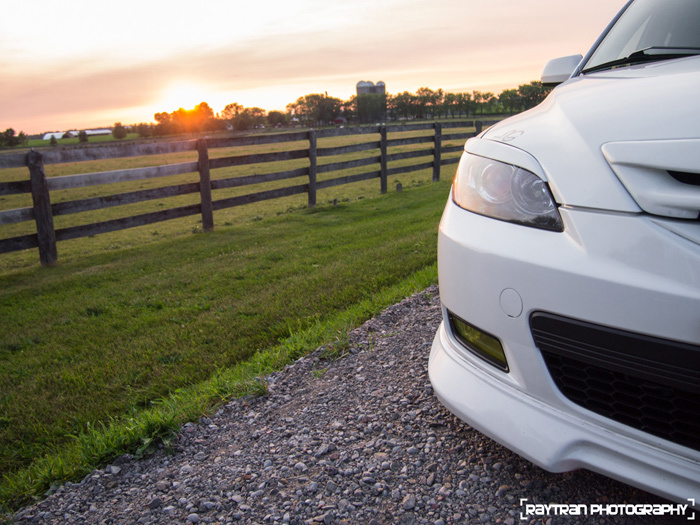 One perfect example of a car from this group is JDR’s 2004 GT and second is today’s featured ride: Jon’s White 2007 GT. As an employee at Nextmod Jon is constantly surrounded by some of the best cars in the city including Nextmod’s own Varis STI and R35 GTR. 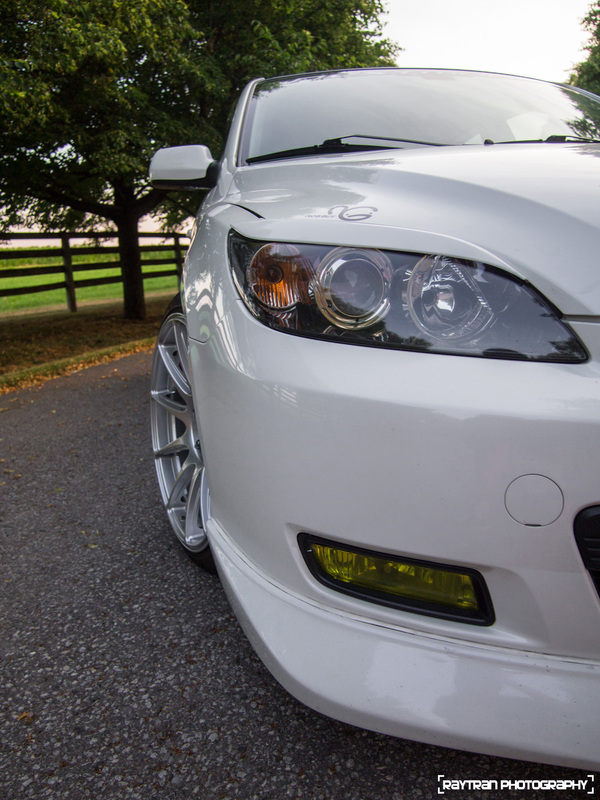 Since Nextmod is one of the top tuning shops in the area Jon had all of the resources he needed to build a car that would fit in with his peers right at his finger tips. Jon’s car, like many featured here, has been an ongoing project that has progressed steadily over the years with modifications coming and going before it ended up looking how you see it today. 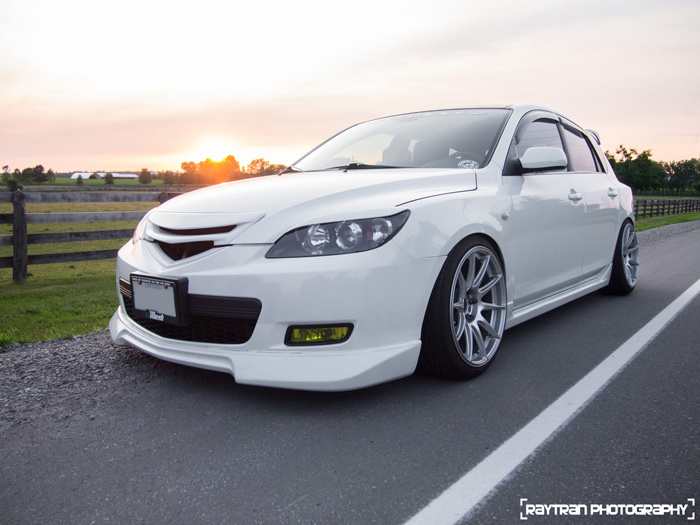 Gone is the race inspired look from years past and with it went additions such as as sideskirt exentions, rear flares, a carbon fiber front diffuser, and carbon fiber hood. Retained are the modifications John felt worked best with the car like the DAMD front lip, Nextmod Windovisors, MS3 rear spoiler and BC coilvers. 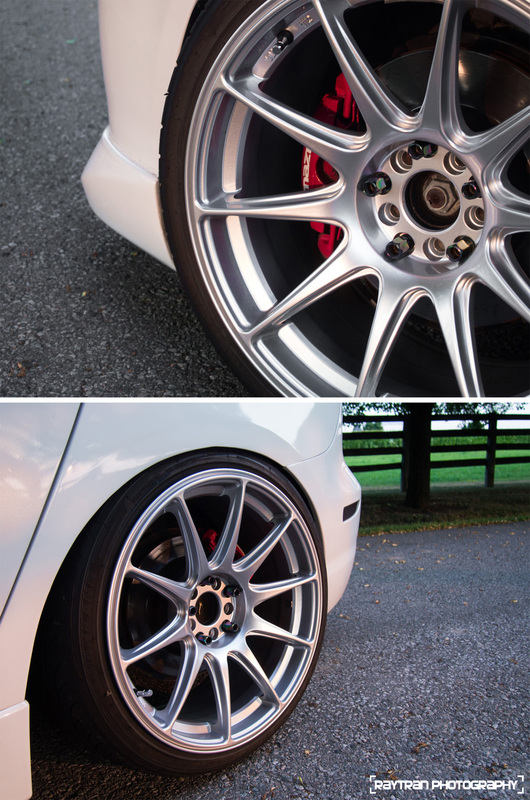 The Advan RG-II’s that were on the car before fit it’s previous look quite well but for 2012 Jon decided that fitment is paramount so he went with a much more aggressive set of Hyper Silver XXR 527s in 18×8.75 +20 square fitment. Wrapped in 215-40-18 Nankanag NS-II’s these new rollers just clear the fenders that have been rolled and pulled by Velocity Autobody. 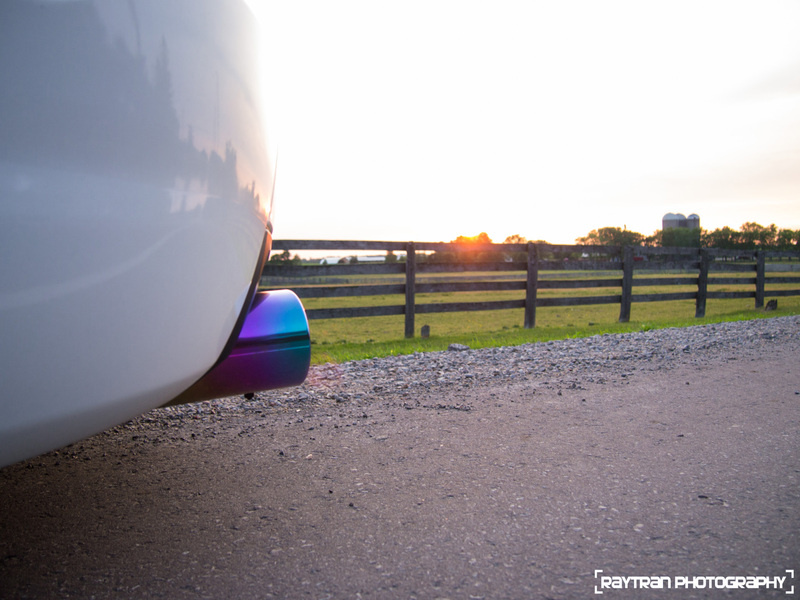 When the car was in having it’s fenders massaged Jon also had the hatch shaved, which looks great combined with Speed3 lowever valance and set off by the unique Fujitsubo rainbow finisher tip and matching catback exhaust. 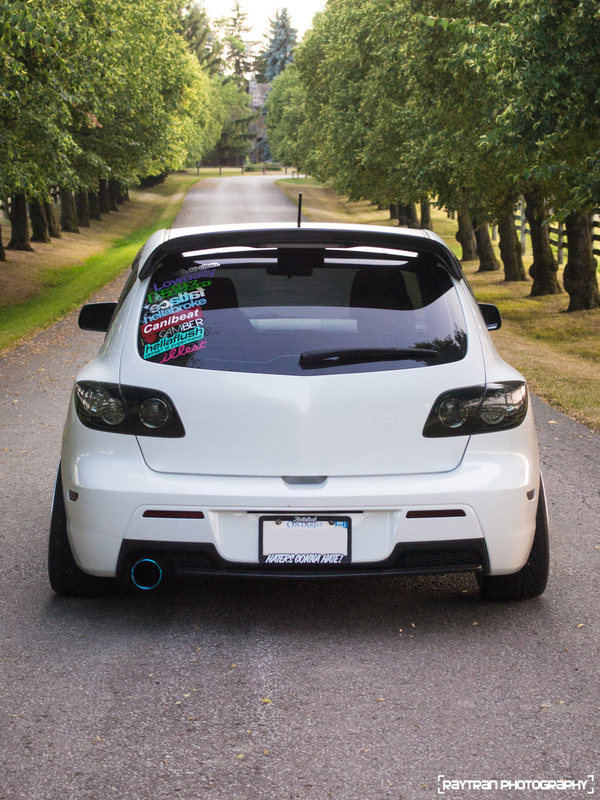 As a Nextmod customer, and Mazda 3 driver myself, it’s been great watching Jon’s car continue to progress over the years and I almost feel bad for Jon knowing that working where he works his car can only stay like this for so long before the mod bug starts to itch again and it’s down the road to another great looking revision. Big thanks to Raymond Tran for working the lens on this feature and I hope to get the opportunity to work with Raymod and RayTran Photography more in the future. Previous articleWTF Friday: Well now you’ve gone and done it. More importantly, did he say what happened to the green wheels? Not sure about the caps but the Green wheels were fading. how does you back hatch open with the shaved button or did you install a new locking mechanism that allows you to open it by remote. I really want to do that to my car and am very curious. See the notch in the bumper? The Handle is there to pop the hatch. I know this will seem stupid, but I’d love to know who he has insurance with. Just sayin. Hi! How do I talk to John?. 07 GT, not sure the tip size. Does Jon have a way to contact him? I’d like to know how he got the neochrome look on his exhaust tip. 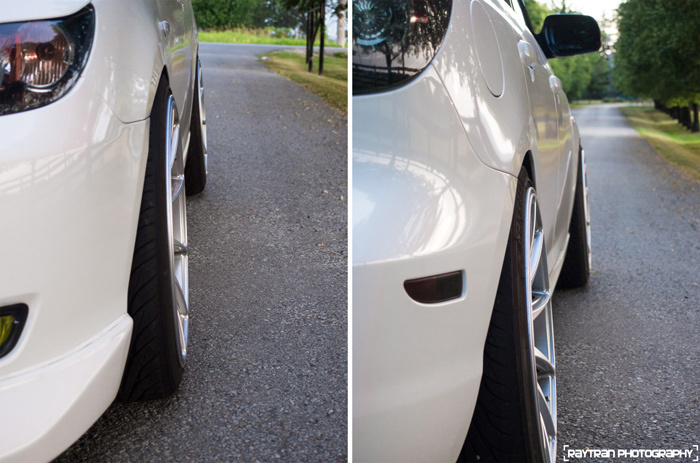 I’ve got a Corksport catback exhaust for my 08 GT and i’d really like to do this to the tip.